Yang Mian’s culture critique, via negated media images – like Zhang Bin’s work on mass culture – has an intriguing quality. Young, ‘ideal’, smiling women drawn from the pages of magazines are depicted in an atopia, yet torn and disrupted by a slash of paint, a kind of counter-brand, a horizontal brush stroke reminding us of Manzoni’s cut canvases. These ‘cuts’ act as material alerts to seduction. ‘Surface’ is contested by the ‘cut’, and the blurred monochrome space turns from anodyne to eerie. The space of Yang Mian’s architecture series is that of international-style interiors, a weak-hued everywhere in reified culture: body as standard appearance, architecture as standard social enclosure. Feint greens and blues are slashed with yellow and pink. Woman’s body is articulated to every space, under a threat of emptiness. The force of alienated sexuality and sociality is the danger signal in Yang’s work, especially from the larger groupings of such paintings. The political pop of 1990s Chinese art, a brash confrontation with international commerce and the commodity image, in his work seems to be slowed down, moved to the site of subjectivities, desire and performativity. It opens onto a world without symbol or narrative, one fuelled by the illusion of choice and the incessant allure of transient fashion. This world closes in each case with a fearful reminder – the force of aggression and conflict between ourselves and any ideal form. Power-gender-property appears to be the zone into which he calls us for debate. The serial nature of his output over six years suggests that a methodical critical enquiry underpins his lively wit and ambition. In the work of Shu Hao, who seems to have learned directly from Zhou Chunya, there’s a surreal energy from selective collisions in iconography: insects, dinosaurs, pairs of shoes, pairs of tea glasses, toys, hairy skin, pink tongues. An eroticized micro-world becomes an archaeology of the contemporary cultural landscape. There’s no chance of kitsch enclosure, as the rough, excited brushwork – in the fewest yet most varied of gestures – refuses sentimentality whilst retaining humour and warmth. There is a vitality even in the range of sizes of canvas, adding to the energy from disrupted imaginary spaces and figures filling these spaces. Shu’s history seems long, long after the Cultural Revolution, outward looking, honest, locked into the visual culture of global media in order to expose the pain of attachment coursing below the excitement and fascination of animal bodies. We are brought to the edge of grotesque hallucination in these works whose subjects appear first as reassuringly familiar, innocent and unthreatening (only to play upon our instinctual drives and buried memories). In a catalogue essay for an exhibition of Yang Liming’s paintings in Shanghai, Zhou Chunya observed that Yang’s work did not seem to fit the mainstream of contemporary Sichuan or Chinese painting : the bare energies of line and colour, at home in world abstraction, close to the monochrome tradition, seemed indeed adrift from the dominance of Chinese figure painting or the concrete images so often attuned to the inconstancies and brutal hardships of Chinese lives. Yang Liming’s compositional series in blue-grey, with their wave upon wave of overlaid lines – his “unremitting pursuit in Chinese traditional calligraphy” (Zhou)* – certainly oscillates upon the surface of modernity, I agree, moving us towards structural variation, or shifting patterns of sense and feeling. Its material language is restrained , operating with fewer variables (brush lines, colour field, surface ‘irregularities’, rectangular enclosures). Its philosophical ground – scientific, universalist, paradigm-governed, ‘reasoned’ play – is secular, coded and professionalised, upholding the autonomous game of painting. The image it unveils is the ur-image of difference within similarity, the contained energy of communication itself, akin to sound within language utterance. The void and infinity of eastern aesthetics isn’t really sought after, yet there’s an echo of this. The paradox of seeking ‘essence’ in conditions of movement registers in the optical engagement within controlled artworld spaces (even the studio). Most of us know the sadness of the disappearance of animals, and welcome also the ethical confusion which can arise from recognition of our own animal condition. There is anxiety in the closeness of our shared existence: having turned animals into soulless machines we are then faced with that image of ourselves when eye to eye with any other living creature. 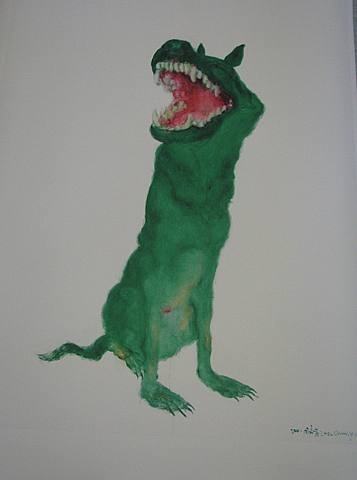 So it is not sentimentality – nor the most subtle of satirical techniques – which allows Zhou Chunya to talk of the treatment of dogs, particularly his own wolfhound dog, when discussing the ‘Green Dog’ series. 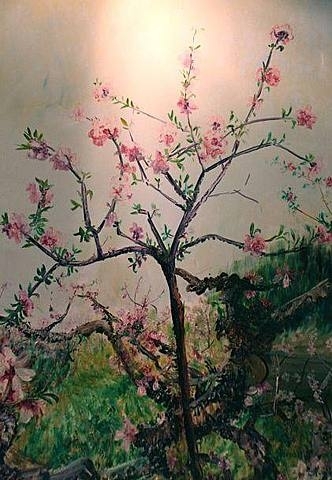 It is apparent too that this painter, in his wisdom, has reconnected with a complex, rich continuous tradition in the history of painting, the Chinese tradition encompassing ink painting, calligraphy and watercolour (distempers to be precise). And he has done this from a relaxed stance within the practice of neo-expressionist oil painting, with us since early last century in Europe. The material, haptic qualities of the language of oil painting , with its potential for sensuous apprehension of a world, may be what makes his work cross-cultural and ambivalent, especially when we look upon revived classical Chinese subjects (the Floral Series or Stone Series paintings). The medium in this instance allows the revitalisation of an abandoned or laid-aside tradition (a past). To bring passion to a calm, intellectual, scholarly world, is to fire it up for significance and signifiance, one might say. Zhou usually does this via his sensibility for colour (which always escapes being a language) and through the very desire to activate the iconographic tradition of Chinese painting. The arena of neo-expressionism is the politics of the responsible Self, allied to the exploration of a divided Self, and the celebration of nature’s encompassing energies. 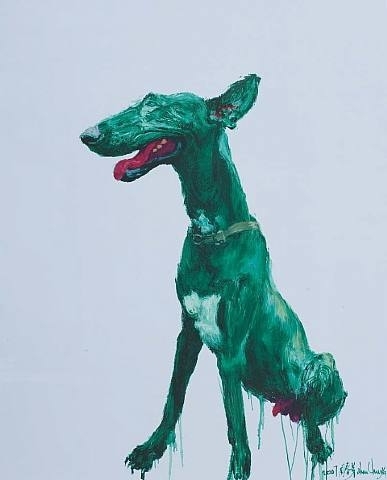 If the ‘Green Dog’ paintings delve into Eros, the rock paintings have the undercurrent of the death instinct, whilst the floral series hold out for survival, security and care. Though far from the conceptually-transformed versions of painting which have been witnessed in the West since the 1960s, work by these four Chinese artists acknowledges the modernist principle of meaning constituted through the elaboration of formal means. Yang Liming’s abstraction has a subject, as we have seen, though no explicit concrete image as is found in the others’ work. In China’s relation with modernity, and now with its embrace of global capitalism, all should have concern for the escape from a ‘utopia-catastrophe’ society: art’s promise and demand of freedom from repression can make non-conceptualised, non-reflexive painting practice appear timid or conservative. That would be both wrong and unfair, in this case. Every single work still can be approached as the crossroads of historical and psychological forces of the precise but unevenly determined ‘moment’. It will require a Chinese critic or art historian to excavate the intricacies of such potential meaning and significance. exploited labour, polluted zones, consumer spectacle, lost sociality. I could have asked similar questions in a less dystopian frame, still remaining open to the probability that technical mastery (rationalisation) was the core problem (East or West). Believing the best work everywhere to have poetic energy and something of the void, obscurity and enigma in painting/of painting can be a kind of satisfying answer, especially when works are capable of holding us in sensuous looking, structural looking, perceptual multi-stability and variation of approach, not to mention imaginative leaps into elsewheres. The responses of the four painters alongside the character of the questions posed should be thought through with regard to two poles of evaluation, I believe : the extremes of commodity form production (and its associated mentality of waste and fetishistic appetite) on the one hand, wild irrationality on the other. None of the four sit at either extreme. I sensed enough strength of purpose and fortunate circumstance to see the shape of a dialectically revived practice of painting (in Zhou’s work especially), a collective position but not a uniform one. Indeed, I was able to feel the pressure upon young Chengdu artists – from their studio stronghold – to create a genuinely critical art, a restless art, one openly enquiring in all directions from a base in friendship, mutual support and collaborative effort. Special thanks are due to Fay Peiyan at Chengdu Art for her role as translator during the four interviews and for her assistance in scheduling meetings. This is a really interesting case study on a group of artists developing a thoughtful critic of their landscape through painting. The visual language can be a very powerful way to challenge ideas. Thanks for this article. This is my first visit to New Linear Perspectives, and I am delighted and grateful to come across such a thoughtful and erudite article, opening my eyes to both the ‘otherness’ and the commonality of artistic practice on the other side of the world.